52 YEARS OF SOUTHERN HOSPITALITY! Family Owned & Operated since 1967. Minutes from Historic Sites, Art & History Museums, Unique Dining, Antiquing & Shopping, Whitewater Rafting, Hiking & Biking. See visitcolumbusga.com for 51 reasons to spend a week or two! I can't image how Good Sam can rate this ampgroung 9-8-9. It is beyond OVER-RATED!! 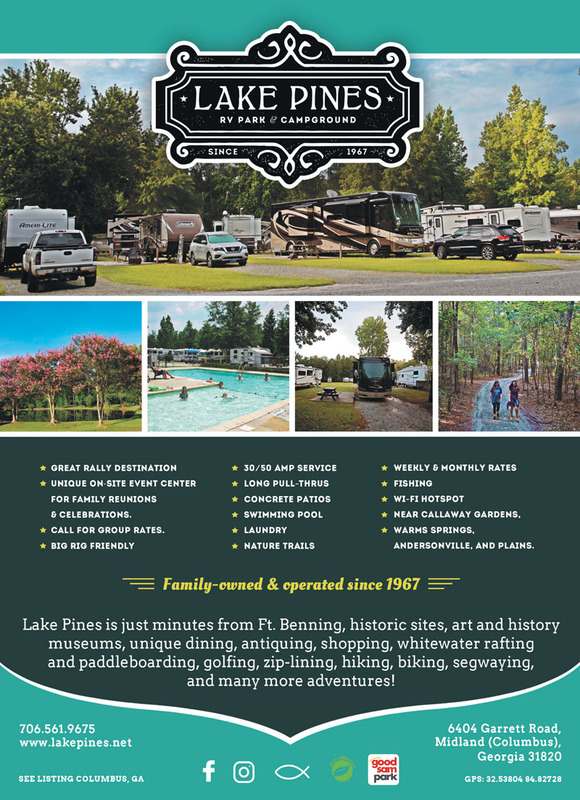 Lake Pine RV Park and Campground advertises being over 50 years in business. I must say- the bathrooms look like it. I don't think they have been upgraded since the campground was opened. The streets are all gravel which makes it very dusty during no rain. 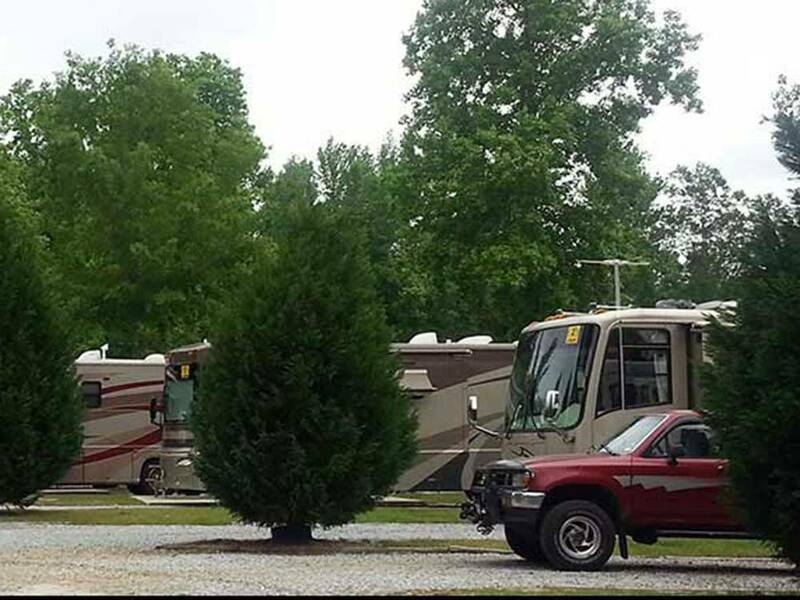 The campgrounds appears to have at least 90-95% permanent RVs. No landscaping except for some trees. The childrens play area is run-down and some of it broken. Sites are close together. I would not recommend this campground and will not stay here again. This is THE place to stay when in Columbus area..everyone is so wonderful there and they treat you like family! We had an issue with our RV and they gave us contact information for a mobile repair service(that was excellent and very reasonable).We stayed 10 days and had a great time ! Thanks to everyone..your hard work shows in all you do !! Very nice people at the front desk who are very helpful. Short drive to lots of food and shopping. Has good cell service but be sure you have satellite or your own wifi. No cable or internet at sites. Also be aware there is a train track that runs next to the RV park. Poorest WiFi signal. Not a real problem since I had my own WiFi but should either say no WiFi or fix the problem. Decided to have my propane topped off at $2.75 per gallon took 3 gallons and I was charged $18.00, I would probably stay here again but I won't make the mistake of over paying for fuel in the future without asking for a price up front. I hate to think about how many people are getting the same treatment and not question it. The staff was extremely helpful in working around getting me a good site under busy circumstances with a rally going on. They were so polite while I was having to assist my mother who was having multiple surgeries at a local hospital. This grounds were well maintained and my family appreciated the lake and walking trails. Fire Ant City!!! There are many and some very large Fire Ant mounds all over the park. Yes, they will attempt to explore/get into your RV. It took over three months just to get rid of the scabs and six months to see the injuries go away. The park is maintained but the pool has cement chips in it. They close it when they want (early) whether your using it or not. No campfire containment devices, saw some just light fires on top of the grassy area. When it rains there is a rotten sewer smell from near the rail road tracks. Yep, rail road tracks right next to the park with horns blaring due to road crossings. Heard that an RV left the park without the owners permission - not sure why or the out come but the owner wasn't too happy. Gravel in/out /parking areas. Pot holes all over the place but they did attempt to smooth it out while there. Tight in/out/around the park especially for us big rigs towing a car/trailer. Trees that are dead (ant infestation) with limbs falling off. But the worst part is the owners/staff attitude. Basically, build a very expensive house next to the park but reinvest in the park - Ha. Nice appeal & hostess so very accommodating. Beautiful entry & nice spaces. Quite & easy to get to Columbus, Pine Mountain, Warm Springs & other places of interest. Would recommend this campground if you're in the area. Whitewater Express & Blue Heron Adventures offer exciting rafting and ziplining. Rails to Trails- Hike, bike or skate on 11 mi of converted train track. Experience the working 1850's village of Westville. Experience Columbus' world class Military History Museums. The Nat'l Infantry museum-over 70,000 artifacts & covers more than 240 yrs of America's military history. The Nat'l Civil War Naval Museum-40,000-sq ft facility with two original Civil War military naval vessels & artifacts.